This Is Our Contemporary Ceramic Vessel Sink Art Basin, Which Is Perfect ToUpgrade Your Bathroom. With Premium Quality Ceramic, Our Sink Ensures Lasting For Longer. The Popup Drain Design Can Effectively Meet Your Need Of Water Storage And Drainage, Bringing A Enjoyable Using Experience For You. It WillBring An Aesthetically Pleasing Appearance To Your Bathroom. With ThisExquisitely Built And Designed, This Elegant Beauty Will Give Your Bathroom An Absolute Makeover. Don't Hesitate To Buy It! 【Durable and Not easy to Crack】Ceramics has been through high-temperature treatment, it is not easy to crack, you don't have to replace it annually. 【Not Easy to Change Color】The thickened and smooth ceramic ensures that the sink basin is not easy to change color, it always shines like a brand new one with bright white color. 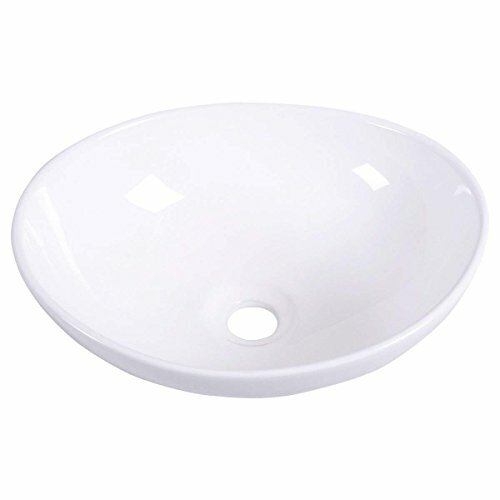 【Easy to Keep Clean】This basin ceramic is easy for you to keep it clean. It saves time and energy for you. 【Scratch-Resistant Surface】The basin surface is durable and not easy to be scratched. You will like the thoughtful design. 【Simple Style】The basin has no complicated designs. The simple style is easy to fit into any style home decor. It is perfect for your bathroom.